Four’N Twenty is selling a new product, the Four’N Twenty Topper. 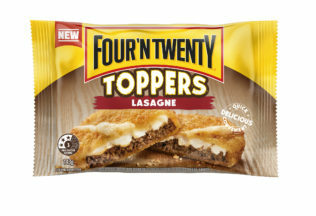 The ‘Four’N Twenty Topper’ is a hand-held breadcrumbed parcel designed for Australians who want to eat something quick on the run. Three Topper flavours are available – Lasagne, Mac ‘N Cheese and Chicken Cordon. Four’N Twenty Chief Executive Officer, Paul Hitchcock, said Four’N Twenty is proud to launch a completely new product. “We have bridged the gap between a snack and a meal with delicious food on the move,” Hitchcock said. In March 2017, Four’N Twenty conducted product testing with 1, 000 consumers, finding more than 60 per cent of its target market were “hungry for the product”. The Toppers are individually packed in heat up wraps. Each serving is 145 grams and the recommended retail price is AUD $2.50. Toppers will be sold individually only and are available now from the freezer aisle of Woolworths. IGA, Ritchies and Drakes independent supermarkets will stock Toppers from 16 October 2017. The Four’N Twenty brand is owned by Patties Foods which also owns Herbert Adams, Chefs Pride and some Nanna’s branded products.